A couple of months ago, I visited an exhibition at the Tarrawarra Museum of Art in the Yarra Ranges, ‘Animate / Inanimate’ is a group exhibition featuring the works of local and international artists; this extraordinary collection depicts the relationship between life and death through a range of large scale installations. 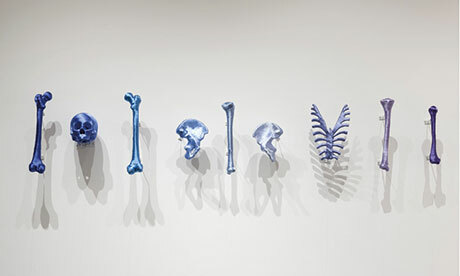 According to Victoria Lynn in “Tarrawarra International, 2013”, the exhibition explores the connection between the animate and the inanimate, human and non human. There was one installation in particular that immediately captured my attention, the very first gallery space features the works of Lin Tianmiao, a contemporary artist who has displayed a range of synthetic skulls that are covered in bright and colourful materials. The silk thread does provide an artistic effect that invites the spectator to view these three dimensional skulls from an entriely different perspective. In the Western culture, the skull is normally perceived as a subject of fear, dread and anxiety, on the other hand, Lin Tianmiao uses bright and colourful silk thread that provides an artistic and innovative portrayal of death. In a way Tianmiao’s skulls become the subject of ‘beauty’ and simplicity as referenced by Anne Madeline in Art Almanac. 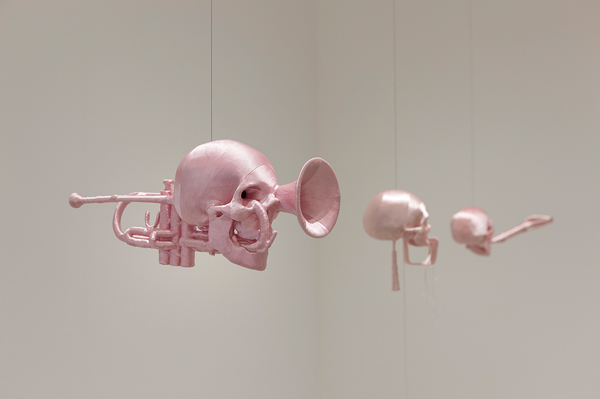 Tianmiao’s synthetic skulls are combined with a range of inanimate objects, such as musical instruments and gardening tools that also feature a very unique composition. 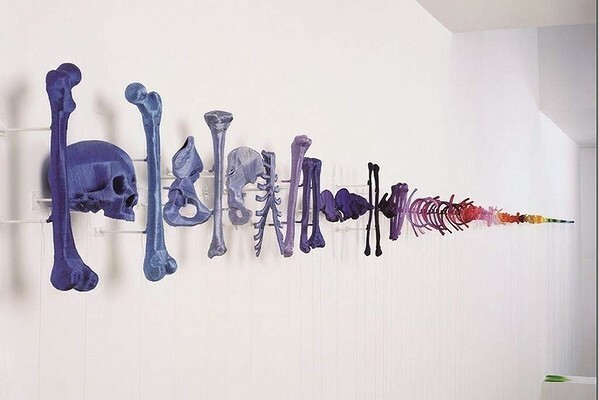 From a personal perspective, Tianmiao abstracts the original shape of the skull through a range of miscellaneous items; the installation explores how the human skull becomes an ephemeral object. The exhibition invites me to speculate upon the human form, the human body is ephemeral and nothing in life lasts forever, even when death occurs, the body continues to decomposes until there is absolutely nothing left. Each sculpture is attached to the ceiling with a piece of thread, as I continued to walk around the gallery space, I suddenly began to notice that the skulls would gradually rotate. This is such an innovative idea, as this allows each visitor to view the skulls from a different angle or perspective; I actually enjoyed walking in-between each sculpture / installation, this also provided a very unique experience, you don’t often have the opportunity to stand relatively close to an original work of art, most of the time there’s always a glass window or a strip of red tape protecting the works on display. The gallery lights are placed in various positions within the space, each installation features a unique shadow that also creates a range of unusual patterns and compositions. This also provides another dimension to Tianmiao’s installations, at first I was attracted to the bright pink synthetic skulls twirling around within the centre of the gallery space, I then discovered the shadows that are refelcted onto the gallery walls, in a way these abstract patterns become a separate work of art! On the other side of the gallery space, there were a range of synthetic bones that were also covered in multicoloured thread, these bones were attached at the very top of the wall in chronological order. The bones do increase in size from the entrance of the gallery all the way to the other side of the space, this also provides a rather unique composition! I’m used to viewing artworks / installations at eye level so this was definitely a nice surprise, I had to tilt my head towards the very top of the gallery space in order to view the second installation, in fact the synthetic bones do feature a quite a unique proportion that also adds a very interesting effect to the overall exhibition. 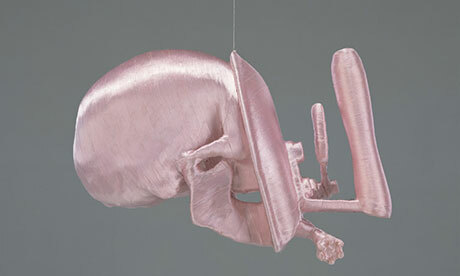 These synthetic bones are also wrapped in colourful thread, in a way the artist has created a gradient, a spectrum of colour that ‘abstracts’ the human form, as referenced by Victoria Lynn. So the exhibition has also questioned whether the human form in both animate and inanimate, it’s quite an interesting theory when you think about it. Well, when we’re live, the body is animate, when the living body dies what does it become? In a way the skeletal remains become inanimate, they’re no longer apart of a living, breathing organism, the skull becomes a skull, it doesn’t move or run away anywhere, it’s a skull that becomes apart of all the other inanimate objects in the world, right? Yes, I know as strange as it all sounds! This what I love about this exhibition, the works on display do invite me to speculate about the human form, about my own physical existence. It’s one thing to actually view a sculpture or a painting but it’s a totally different thing when you actually begin to look further for the possible meaning / interpretation. While there were other works on display , I was particularly fascinated by Tianmiao’s work, the synthetic skulls were displayed in a very unique and innovative manner that also provided a unique perspective of space and proportion. The installation was definitely different from anything else I have ever seen before, not only was I able to view the synthetic skulls, I was physically able to weave in-between each individual sculpture that did create a very unique experience. I would definitely recommend visiting the Tarrawarra Gallery, the exhibition is fantastic and the scenery is simply amazing!